Orion and Classic pricing is completely different, we will cover the biggest divergences here. 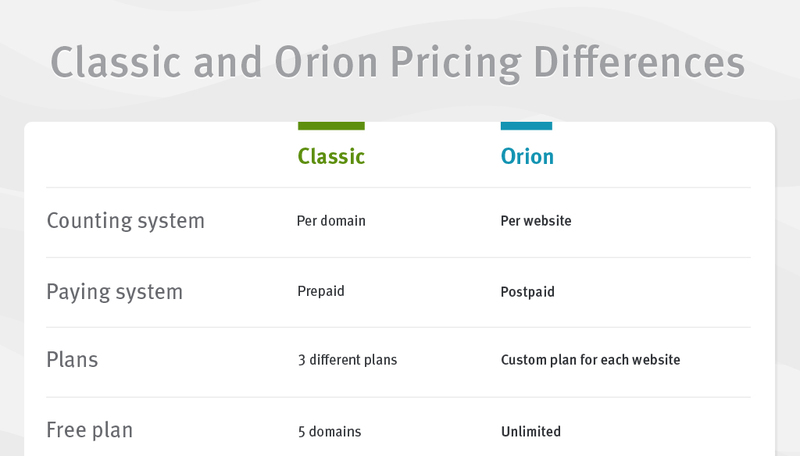 With Orion, we created a pricing system that is flexible and adjustable for various kinds of users. You can add an unlimited number of websites for free. In Orion, you can add as many websites as you wish for free and use 14 features without paying a dime. Most of the premium features have free version as well. Only three features are exclusively premium, other premium features have a free version as well. This means that you have access to most of Orion’s new features without spending a dime. To prevent the price from going up rapidly, you can use bundles. Activating features per website can boost up the price pretty fast for a large number of websites. To prevent that from happening, we introduced bundles that cover certain premium features for 100 websites for a fixed price. Pay for the features after you use them. We introduced postpaid pricing system with Orion. No need to purchase a plan before using anything. You can use a premium feature for certain amount of time and be billed at the beginning of the next month for the exact usage. The price of each feature and bundle can be found here. To explain the differences in pricing better, we will compare the prices for the same features in Classic and Orion. You can transfer the plan from Classic to Orion. You can transfer the plan to Orion and cover the same features that you used in the Classic for the same number of websites (not domains). You can create a custom plan for each website. Not all websites need the same features activated. By moving on from already prepared plans, we allowed our users to activate only the features that they need on each website. This means that Professional plan that costs $21 in Classic was maybe overpaid just for the needs of two websites. That is not an issue in Orion. You can use a feature for less than a month and pay only for the period that you used it. Since Orion uses a postpaid system, you can use a premium feature for half a month and pay only half of the price for that month! Bundles cover certain features for 100 websites, but are cost-effective for more than 25 websites. Bundles cover the feature for a fixed price for 100 websites, but activating a bundle for 26 websites is cheaper than activating features on per-website basis. Not only that, there will be free slots for that feature until you reach the 100. All-in-one bundle is cheaper than activating all bundles. To cover all features for a 100 websites, the best thing that you can do is to activate the All-in-one bundle. 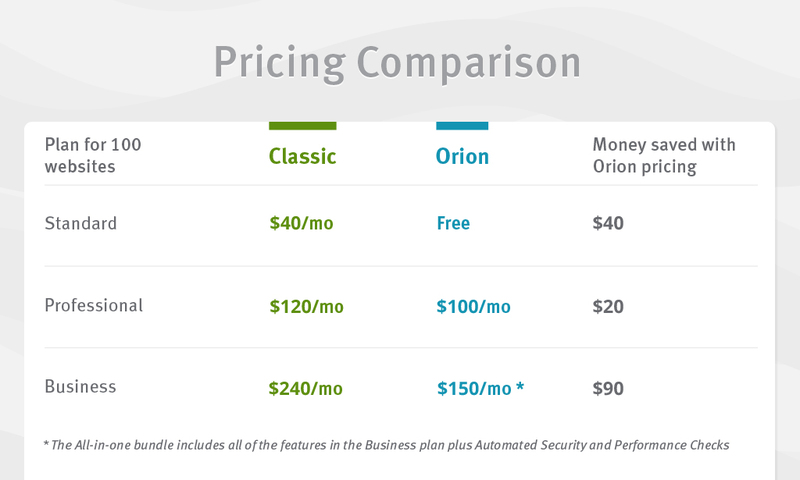 If you compare the price of a Business plan in the Classic that offers 2 features less (no Premium Performance and Security Checks) to the price of the All-in-one bundle in Orion, you will notice that the All-in-one bundle saves you $90/mo and it covers two additional premium features. The system will let you know if your pricing is not optimal. We also have a helpful widget on our billing page. In case we calculate that you can pay less for the same features, the system will alert you about it. You will get a suggestion on how to lower your price (either by activating a bundle or canceling it and transferring to per-website pricing).